American Indian Studies, Anthropology and Archaeology are discussed. 00:02:32The Coastal plain and the Mississippi River embayment are examined. 00:05:39The Poverty Point Culture, a hunter-gatherer culture, built incredible earth works. 00:02:44In the Appalachian Mountains there are many Caves, and cave formations. 00:04:23Nomadic hunters as well as Native American of the Archaic Period and the Woodland Period used the atlatl to hunt game. American Indian Studies and Anthropology are discussed. 00:04:16The Mississippian Culture built the Great Temple Mound at Ocmulgee. 00:02:35The Piedmont and the Blue Ridge Mountains of the Appalachians, are separated at the fall line. 00:03:32Mississippian Culture created the Mississippian City State, pyramidal mounds, ceremonial mounds, burial mounds, and earth works. Hispanic Studies and Environmental Studies are discussed. 00:09:50St. Augustine, founded by on Pedro Menendez, contains the Castillo de San Marcos, and nearby is an outlying fort, Fort Matanzas. 00:04:43Hardwood Hammocks, coastal hammocks and the manatee are part of the unique ecosystem of this National Monument. 00:05:47Florida, discovered by Ponce de Leon, became the site of the Spanish colony of St. Augustine, founded by Pedro Menendez, and the Castillo de San Marcos. 00:06:08The Georgia Colony was founded by James Oglethorpe, who order the building of Fort Frederica near St. Simon. 00:02:22This national monument has a sub-tropical climate with coastal hammocks and Barrier Islands. 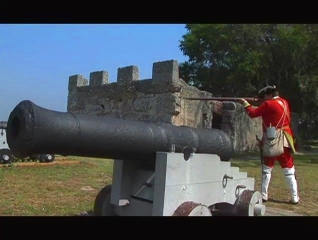 00:04:46The British Carolina colony needed a buffer to protect it from the Spanish, so the Georgia Colony was founded and Fort Frederica was built, where the , Battle of Bloody Marsh was fought. Black Studies, Oceanography and Environmental Studies are discussed. 00:07:14The Virgin Islands, St. John, St. Thomas, St. Croix and Buck Island, as well as the coral reef and slavery are discussed. 00:08:02The Caribbean Islands, volcanic action, plate tectonics, their tropical climate, ocean ecosystems, coral reef, global warming, and coral bleaching are examined. 00:06:57The Danish West Indies were the site of sugar cane plantations, slavery, the slave trade and slave markets, all made possible through the Golden Triangle trade. Black Studies and Oceanic Studies are discussed. 00:04:50George Washington, Chesapeake Bay tidewater land, Virginia plantations and the tobacco plantation are discussed. 00:02:47The importance of the Chesapeake Bay and the region's major estuary is examined. 00:04:37At the George Washington National Monument, the tobacco plantation, slavery, the Virginia colony and Martha Washington are profiled. Black Studies and Geology are discussed. 00:06:29George Washington Carver and slavery re examined at the George Washington Carver National Monument. 00:03:23Ozark Mountains, also known as the Ozarks, and the Ozark Highlands are all part of the Appalachian Mountains uplift millions of years ago. 00:07:06Black scientist George Washington Carver was born into slavery, during the Civil War, a war that came out of the Dred Scott decision which nullified the, Missouri Compromise. Military History and Environmental Studies are discussed. 00:04:03At Fort Sumter and Fort Moultrie the Civil War is profiled. 00:02:07Plant succession resulting in a climax forest of a coastal hardwood forest is demonstrated at Fort Sumter National Monument. 00:03:47Civil War, Jefferson Davis, the Confederacy, Fort Sumter, Confederate troops, the Port of Charleston and Robert E. Lee are discussed. 00:03:09Before the start of the Civil War, Robert E. Lee was the engineer in charge of strengthening the fortifications at Fort Pulaski. 00:02:04Salt marshes, estuaries and mangroves are part of the National Monument's ecosystem. 00:06:07Fort Pulaski was a military fort and coastal fortification, controlled by the Confederate army at the start of the Civil War, however a cannon battle destroyed its masonry fortifications and the North controlled.